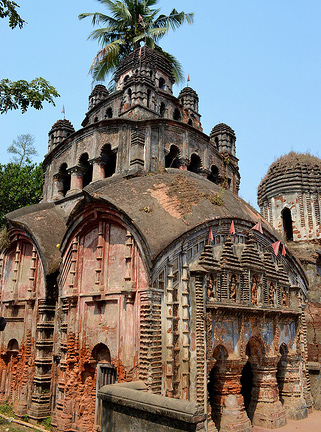 Places to see in Routpara: Rotupara, better to term as a temple city of Bengal, upholds the blend of the two architectural style of temples in Bengal – Ratna (pinnacle) and Chala (sloping roof). The region is famous for housing five temples, three of which have already turned into ruins. 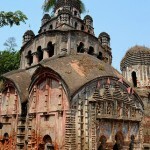 You can visit the Mangal Chandi Temple admired with 13 pinnacles, though none of the pinnacles are in decent condition. The sites of the ruins of the other two speaks about the lost glory of the exquisite architecture of the temples. The fourth temple is a small shrine of Lord Shiva, which was probably built afterwards. However, do not miss the prime attraction of the region, the Durga Mandir, the architectural grandeur of which is not much affected by time. It is also probably the biggest terracotta panel across the Indian State of West Bengal. This grand temple is maintained by the West Bengal archaeology Department. You will be amazed to see the exquisite and intricate terracotta carvings on the three entrances of the temple. The large terracotta panel of Devi Durga on the entrance is truly admirable. This panel is bordered by small sized panels of Ganesh and Lakshmi on the left and Kartik and Saraswati on the right. If you want to explore further, step to the main road to locate another notable octagonal structure of Rashmancha. Though the structure has been renovated, but the modernized version does not hold its past elegance. You can also locate ruins of another Rashmancha, while walking towards Arambagh. Move a little further to view the arched gateways of the Shiva Kutir, a deserted structure, now covered with foliage. Nearby attractions around Routpara: Tarakeshwar temple is a very popular attraction nearby. Things to do in Routpara: You can visit the temples and the ruined temple sites of the location, which are of major historical importance for their architectural style. Explore the region to locate some other historic terracotta structures. How to reach Routpara: In order to reach the destination, you need to board the Tarakeswar Local from the Howrah station. Get off at the Tarakeswar station, from where buses are available to Bali Dewanganj. Drop down at Haldapara, from where you can locate a meandering road leading to Routpara. It takes around an hour and 45 minutes to reach the destination. Best time to visit Routpara: You can visit the destination any time of the year. Lodging and dining facilities in Routpara: Tourists usually do not stay at Routpara, and there are no such lodging facilities available. So, it is better to find accommodation at Arambagh, from where Routpara is easily accessible. Decent dining facilities are also offered in the hotels and lodges of Arambagh. Moreover, there are also many eateries.